Okay, so here is how you make these little Big Hunk O’ Yums. 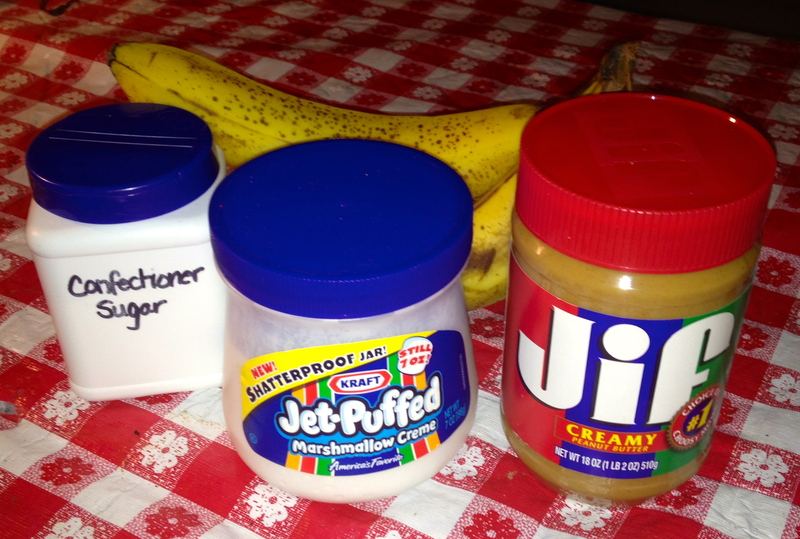 You’ll need bread, a banana, marshmallow cream, creamy Jif peanut butter (I guess if you like crunchy, that is okay, but really… what is wrong with you? 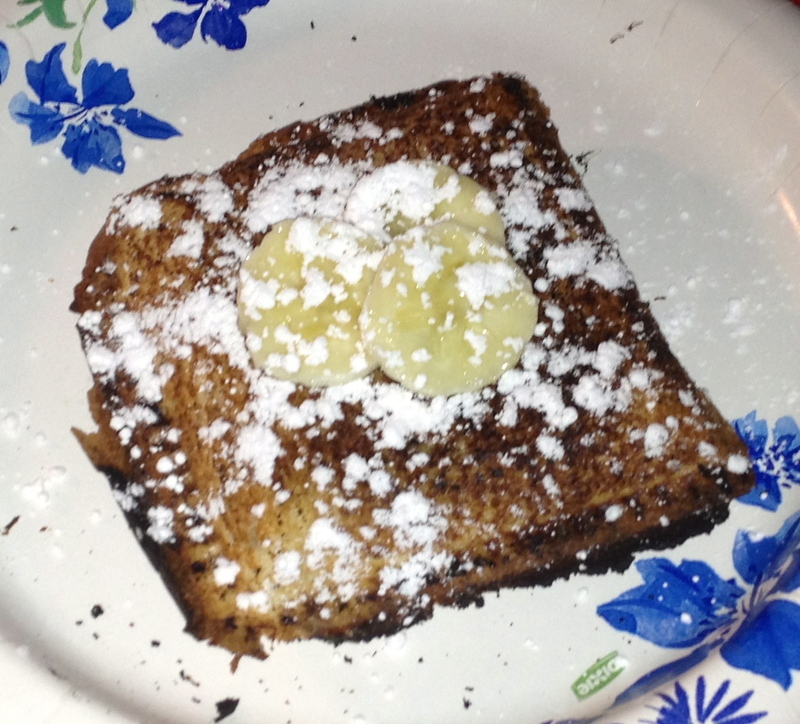 ), and confectioners sugar. Like any mountain pie with bread, start by buttering up with outsides of the bread and get ’em tucked in the hot pie iron. 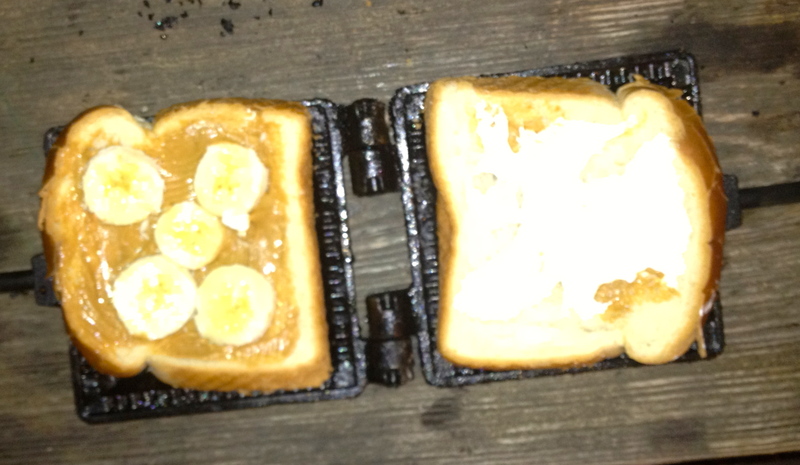 Spread the peanut butter on one side, layer with sliced banana, and smotch (I know, not a word, but it does fit what you have to do to get the marshmallow into the sandwich) the marshmallow cream. Close it up and get it on the fire. Presentation is everything. Even at camp. Put a few slices of banana on top and sprinkle with the confectioners sugar while hot. The sugar gets all melty and divine on the hot buttered bread. Eat. Sigh. Thank Elvis for his contribution to mountain pie nirvana. Butter both slices of bread. Place in the pie iron butter side down. On one piece, spread the peanut butter, top with banana slices, and then add a dollop of marshmallow cream, spreading slightly. Close the iron and cook until the bread is slightly brown. Remove from pie iron and quickly sprinkle with confectioners sugar. “How can you go wrong with peanut butter and bananas?” The judges liked the special touch of presentation and sprinkling of confectioner’s sugar on the outside. It tasted delicious and was a definite success, but there was some tough competition in the category. One of the judges had never had peanut butter and bananas together (I know… kind of sounds like they were missing out on the finer things of life.) But, they are now in on the wonderfulness of the combination.